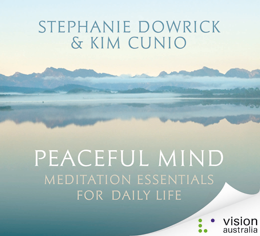 Peaceful Mind is a powerfully effective meditation CD created by Dr Stephanie Dowrick with musician/composer Dr Kim Cunio. There are five tracks, opening with a short talk from Stephanie on how to meditate and the benefits of meditation. The CD also includes a half-hour guided meditation practice and, for busy days, one that takes only 17 minutes. Those meditations are supported by Kim’s sublimely soothing music. There are two music-only tracks, and the second of these features the voice of visionary soprano, Heather Lee. The CD is highly recommended even for those who believe they “can’t” meditate – as well as those who want to develop a more rewarding meditation practice. 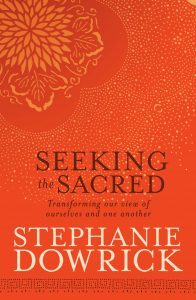 Reverend Dr Stephanie Dowrick is widely known as a best-selling writer, retreat leader, columnist and interfaith minister.Dr Kim Cunio is an internationally celebrated composer and specialist in sacred music. This CD is easily purchased from Stephanie’s on-line bookstore, administered by Seek/Collins.